I've been writing my PhD thesis using the classicthesis template with the arsclassica style package. My university requires that I double-space the body of the thesis, so I'm using \doublespacing for most of the document. This has the annoying effect of double-spacing my chapter and section headings as well. I could manually insert \singlespacing before and \doublespacing after every chapter/section/subsection heading, but this would be very tedious. Unfortunately this doesn't seem to have any effect for classicthesis documents. However, this overrides the nice default formatting provided by arsclassica/classicthesis. But, as Gonzalo pointed out, this prevents the TOC from being generated correctly. 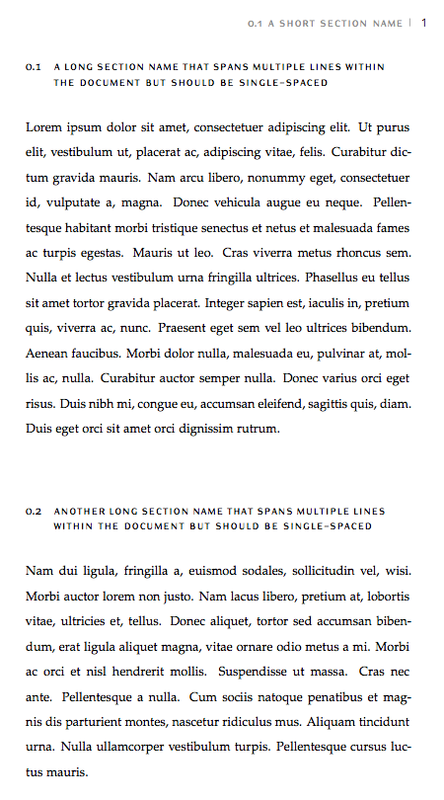 In short, I'd like to know whether there is a better way to specifically enforce single spacing for chapter/section/subsection headings within an otherwise double-spaced document that uses classicthesis/arsclassica. With or without arsclassica is the same. Not the answer you're looking for? Browse other questions tagged sectioning line-spacing classicthesis setspace or ask your own question. Single spaced footnotes with bigfoot?